$113 Say goodbye to squashed bread. 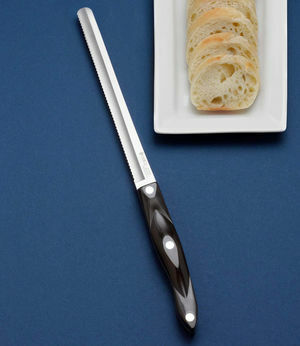 This bread knife glides effortlessly through freshly baked breads. The long, narrow blade provides thin slices with one continuous stroke. Great for slicing angel food cake, baguettes, boneless ham and for shredding cabbage. 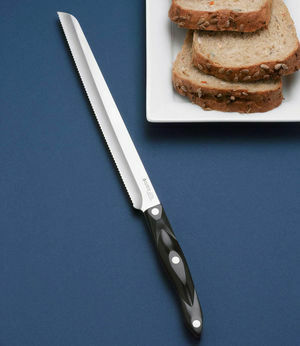 $109 Use this bread knife to slice cake, warm bread and triple-decker sandwiches. The long, narrow blade provides thin slices with one continuous stroke. Great for slicing roasts, prime rib and ham. Also shred cabbage and lettuce. $120 A Santoku version of Cutcos Slicer. 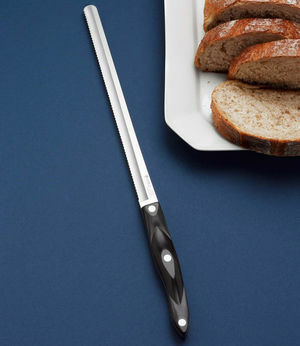 This knife glides effortlessly through freshly baked breads. Long, narrow blade provides thin slices with one continuous stroke. Great for slicing angel food cake, baguettes, boneless ham and for shredding cabbage.